Who knew Jane Austen could be so wickedly funny? 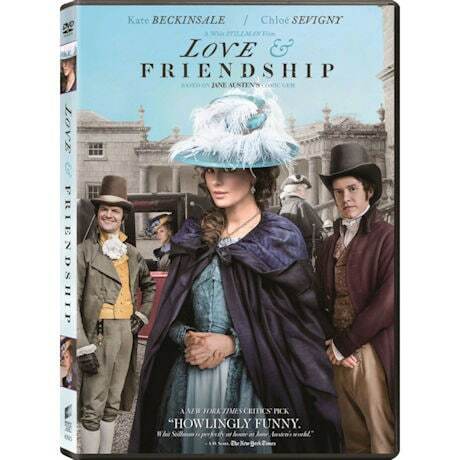 Based on her novella Lady Susan, adapted by American director Whit Stillman (Metropolitan) and set in the 1790s, Love & Friendship follows the fortunes and schemes of Lady Susan Vernon, a beautiful widow. Taking up temporary residence at her in-laws' estate, she starts looking for husbands for her daughter, Frederica, and herself, naturally. Kate Beckinsale (Total Recall) stars, with Chloe Sevigny (Big Love), Xavier Samuel, and Stephen Fry. 93 min, 1 DVD, CC. Mature audiences.